WIDMER’s P-400 Series Perforators - Technology Unlimited, Inc.Technology Unlimited, Inc.
WIDMER’s P-400 Series is uniquely designed as an economically priced, heavy duty table top perforator that is both compact and portable. Operation is easy and safe. The extra long handle provides a smooth, single cutting action. This secure method of punching holes in documents permanently cancels or validates up to 8 documents simultaneously. 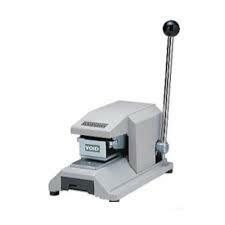 The Model P-400U perforator is unique in that almost any 7 character word can be installed. The P-400U provides virtually limitless applications to fulfill your needs.